It’s Beginning To Look A Lot Like…Normalcy? 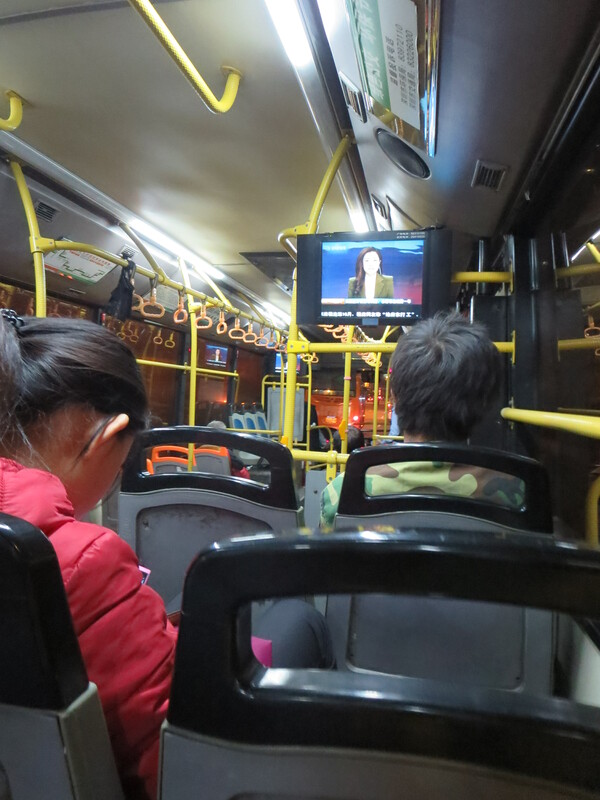 This is a view I see everyday: people sitting on the bus, watching a CCTV newscast, just waiting to get to our destinations (mine are usually food-related). I often read my kindle and keep my eyes down to avoid the constant stares that STILL HAPPEN, but Game of Thrones is getting really good, so I don’t mind looking down so much anymore. The stares I encounter on public transportation are no longer new to me. Yes, they’re still weird, but they will always happen. They have become mundane and just a part of everyday life as an American here. These things just kind of happen in China and, you do eventually get used to them, to some degree. Gross. Don’t you know babies put their butts on that counter? And food is supposed to go there as well? When I first saw her doing this, I hardly even thought about this being weird now. I was like, “Well, that’s kinda gross, but not nearly as bad as some other stuff I’ve seen lately.” Literally, before we walked in to get our chicken, a little boy was peeing on the sidewalk and we just walked past him without another thought. And that’s when it hit me…this is “normal” now. Yes, there are still things here that I think I will never get totally used to (kid poop in the street, the general refusal to stand in a line and attempt to cut in front of everyone so you can get your ice cream first, etc.) but some of the things that I was really distraught by when we first got here have become much easier. I know how to say the name of where I live, I can teach a classroom full of 80 students with no problem, I can shop for clothes, I can give basic directions to a cab driver, I can hear and answer basic questions in Mandarin, oh my god! I can even order my own food sometimes! Progress! I’m not anxious about everything anymore and that’s a big step for me. “Hmm, we have a horizontal picture but we need a vertical one. No matter, just turn it vertical anyway. No one will care that her head is floating sideways.” –Magazine editors. 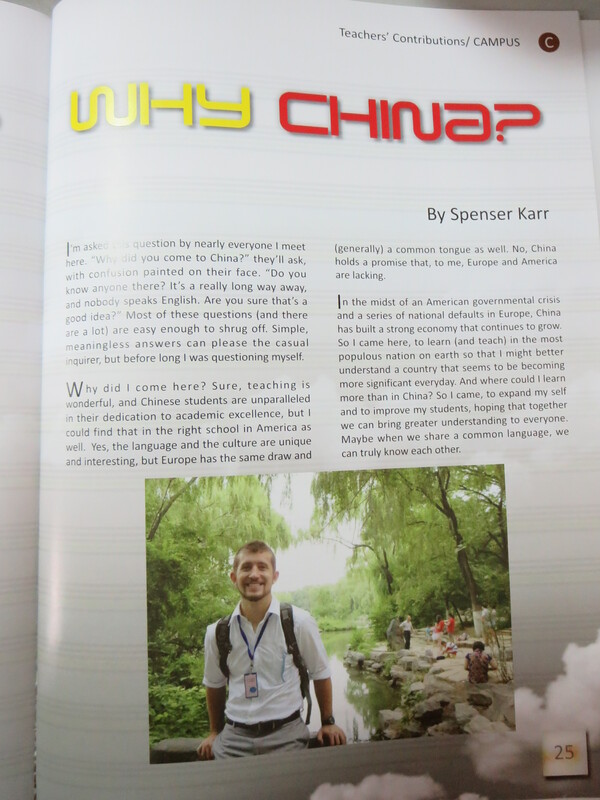 Our school recently published their annual English language magazine, and it included articles from both myself and Spenser about moving to and teaching in China. 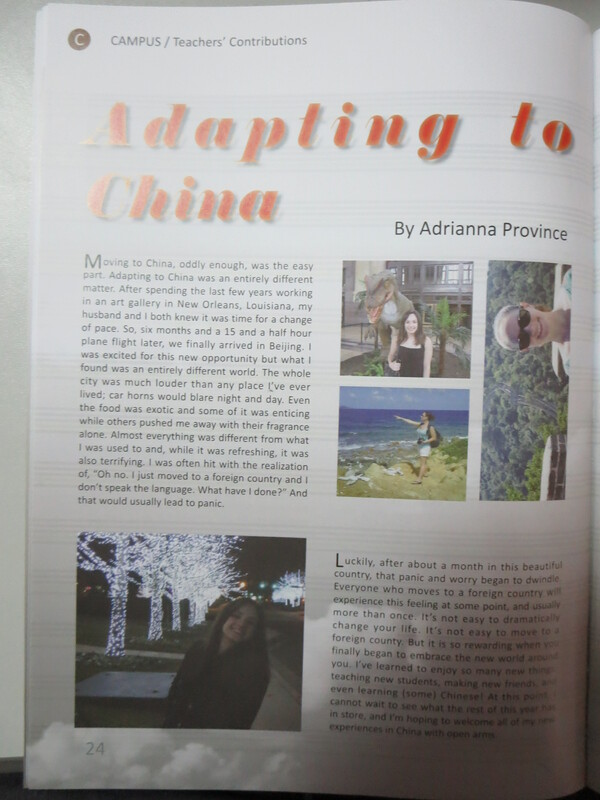 We wrote these articles a few months ago (and I honestly forgot what I wrote about), but upon seeing my headline again, “Adapting to China”, I felt that that was exactly what I was doing lately, adapting. And that in itself, is pretty cool. It’s so nice knowing that no matter what weirdness might happen, you can complain about it to a bunch of people going through the exact same thing. That’s always nice. 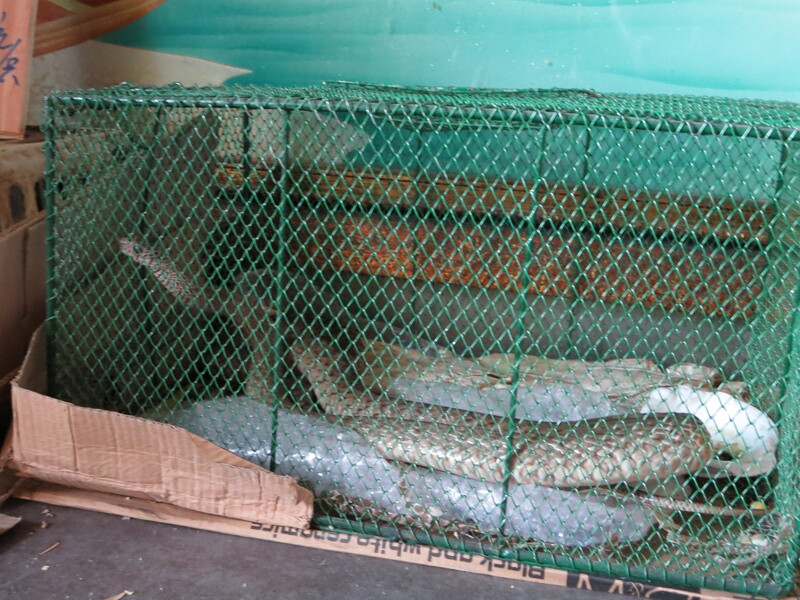 Would you like some snake for dinner? HA! Thanks for the new post. I see you have transitioned to long sleeves! I hope you are saving those articles to share when you return, although I believe I was able to read them as they are posted. Love this post on your new normal! Miss driving much?